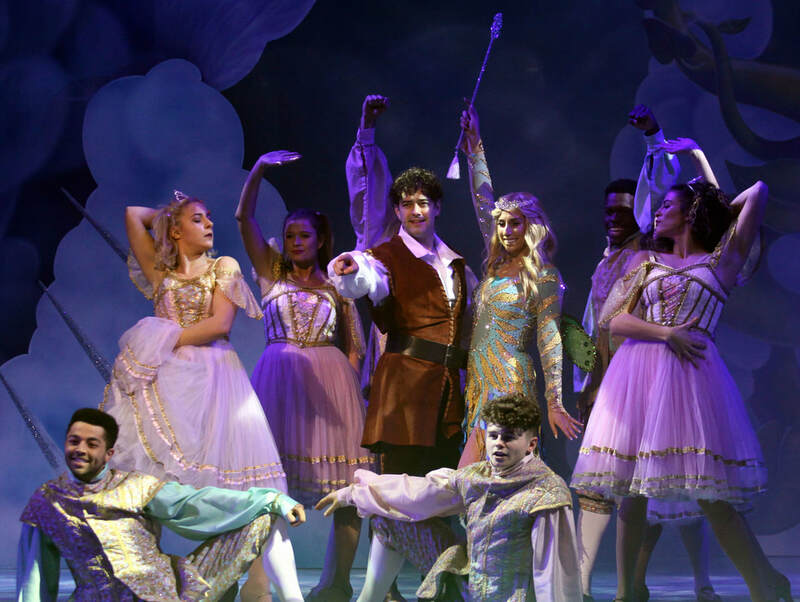 This year’s panto at the Cliffs Pavilion, Jack and the Beanstalk, is a wonderfully home grown affair, with Southend’s very own Lee Mead taking a star turn as Jack Trot along with ‘Loose Women’s’ lovely Stacey Solomon, who hails from Dagenham, just up the A13, appearing as the magical, Mother Nature. Completing the lineup is comedian, Bobby Davro, providing the gags, as Silly Billy; Robin Askwith, probably best know for the ‘Confessions’ films, getting to go ‘full out villain' as the Giant’s evil sidekick, Fleshcreep and Stephanie Clift as Jack's love interest, Princess Apricot. Of course a vital ingredient to every panto is the panto dame and David Phipps-Davis takes on the role of Dame Trot with full aplomb and does a great job of keeping the pace of the show going throughout. His staggeringly wonderful operatic singing voice completely blew the audience away - and yes, it really is him singing! I think it’s fair to say that Bobby Davro’s jokes may leave the adults in the audience groaning but from the laughter and screeching that was to be heard on Press Night, the kids couldn’t get enough of him. Davro certainly knows how to whip up a frenzy and seems to manage this on and off stage, not least during the most exhausting rendition of the 12 days of Christmas I’ve ever seen. I think we all needed to go for a lie down after that particular number! He also gets to showcase some of his impressions, which include Ozzie Osborne, Donald Trump and Michael McIntyre and has the audience cracking up in one skit with Askwith where he responds to everything Fleshcreep says with a line from a song. Askwith, all leather and highlights, plays the villain to perfection and has the audience booing and hissing at his leather-clad devilry. Lee Mead is extremely dashing as Jack and really gets to show off that great voice of his - ‘Joseph’ fans certainly won’t be disappointed. He quite rightly seems to be relishing every moment he is up on the Southend stage. It’s also great to get to hear Stacey Solomon’s voice once again, especially in the “Ain’t No Beanstalk High Enough’ duet with Lee. She has also managed to master some lovely subtle comic timing in parts of the show, which really made me giggle. With lots of colourful costumes, pyrotechnics and the usual audience participation - dad’s beware - this panto really picks up the pace in the second half. One of the highlights of the show are the fantastic 3D special effects which had everyone in the audience squealing in terror and delight. Also, a big shout out to all the techies involved in this production who are undoubtedly the unsung heroes of any show but who really get to excel during panto season. There really is plenty for everyone in this panto with lots of lovely dance numbers from the especially hard working ensemble and the children from local dance school, Junior Masters, together with songs that will have you clapping and tapping your feet such as Justin Timberlake’s ‘Can’t Stop the Feeling’ and Clean Bandit’s ‘Symphony’ as well as, ‘Ain’t No (Beanstalk) High Enough’. If the smiles on everyone’s faces at the end of the show are any indication of how much the audience enjoyed this year’s pantomime, then I think it’s safe to say that Jack and the Beanstalk is a sure-fire winner! Grab those tickets now because this year the panto is only running for three weeks as opposed to the usual four and they are selling faster than magic beans!